To hide or unhide the application, you must set and remember the hot key combination. By default, Ctrl + Alt + W is set as the hot key. If you change the default, select a hot key combination that can be easily remembered. Select a key combination and click on the Apply button. 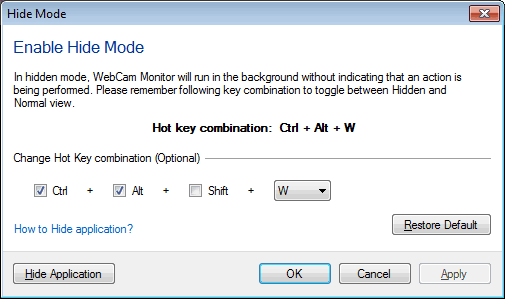 The selected hot key is used to toggle between Hide Mode and normal mode. Note: The Hot key combination should have minimum two modifier keys with Alphabet (A to Z) or Function keys. Eg: ”Ctrl + Shift + F1" or "Alt + Shift + A" or "Ctrl + Alt + F11"